I remember people used to joke that opening day of the baseball season should be a national holiday but I propose a national Ripping Day holiday to honor the day the new Topps set hits the shelves! Gather your family around the table, rip some packs, and think about how thankful you are the next baseball season is just around the corner. 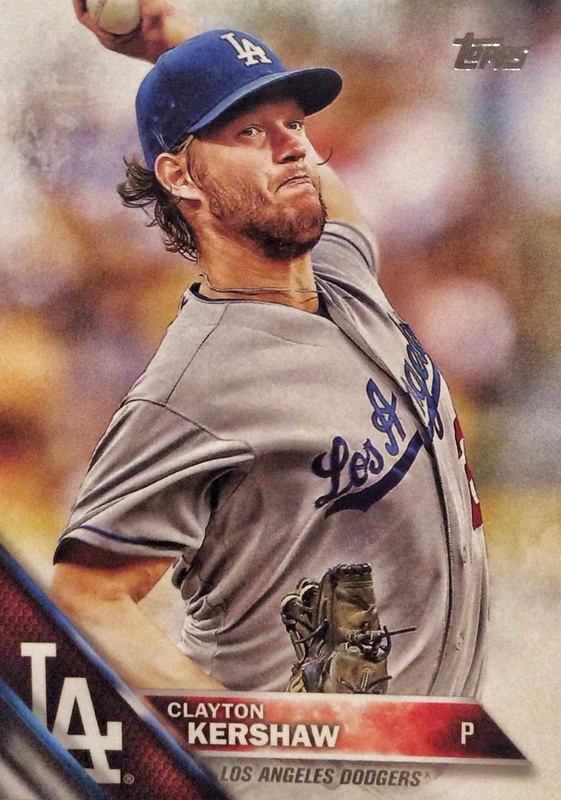 Use this helpful guide of the best cards of 2016 Topps Series 1 as you rip and sort your first few packs of the year. It is also undisputed that the release of Topps' flagship set is the peak of the baseball card collecting calendar, even at a time when huge group breaks and high-end product hits are the focus of card collecting for many breakers. 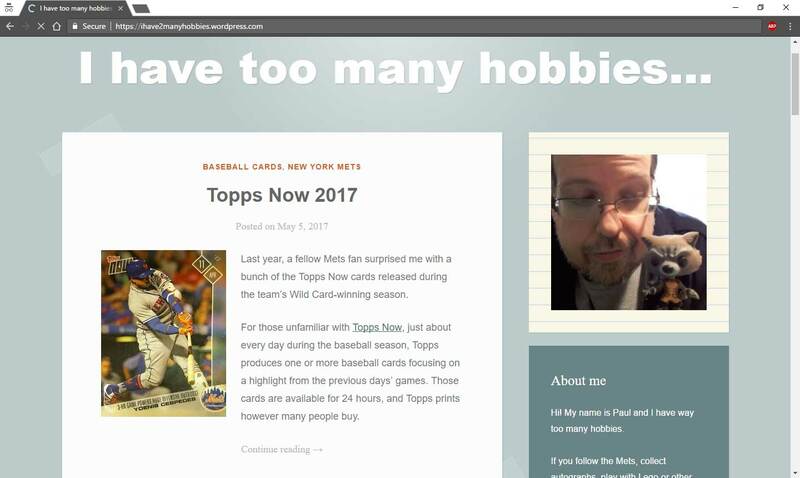 Many collectors, some who don't follow the baseball card market closely and some who are on a limited card budget, return to card collecting year in and year out to scoop up some packs of Topps Series 1 and reminisce about a time gone by. 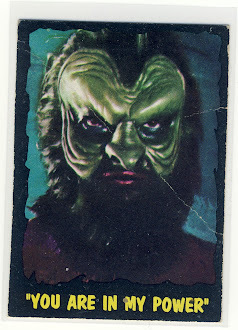 For the sake of simplicity, I have not included any insert or short-printed variations in his list as it is simply the best 15 base cards from the Series 1. 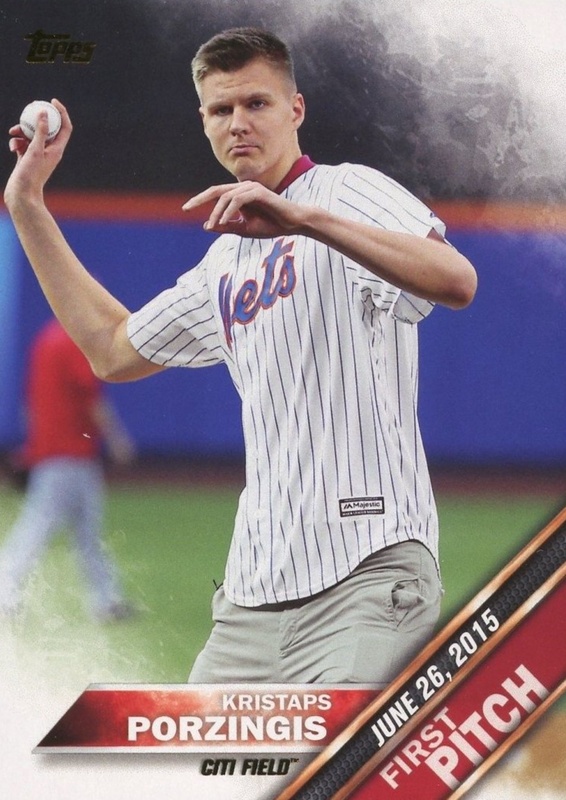 After the remarkable success of Derek Jeter's #1 card from the 2015 Topps set, Topps surely needed to make a splash with the premiere card in 2016 as well. They tapped Mike Trout, the most consistent hitter in the game, for card #1 and you can see his defense is just as impressive as his offense. 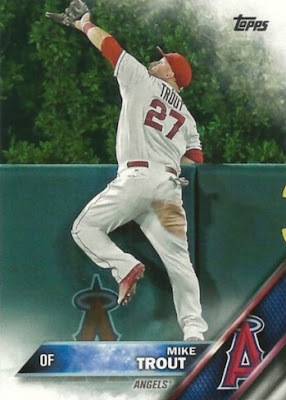 The photo in question was from last September when Trout robbed Seattle Mariners catcher Jesus Montero of a home run at Angels Stadium. Since becoming a full-time player in 2012, Trout has taken back eight home runs from batters, the most in the league. What a difference a change of scenery made for Josh Donaldson last year. 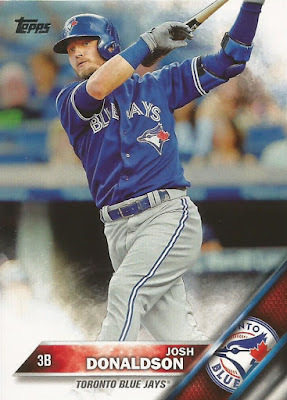 After being traded to by the Oakland A's to the Toronto Blue Jays, he exploded from better-than-average slugger to American League MVP as the Jays won the division. He, along with Jose Bautista (who also makes an appearance on this list) could have the Jays in contention again this season. 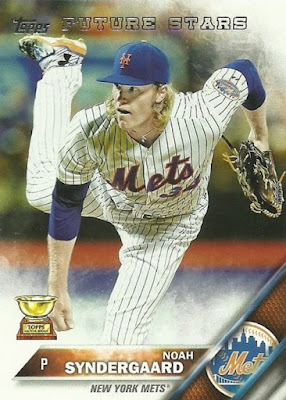 Noah Syndergaard's rookie card from 2015 Topps Update was one of the most valuable and sought after base cards of the series and with his impressive playoff pitching performances in the 2015 playoffs his second-year card will again be near the top of the collectors "must have" lists. It was recently announced that Joe Mauer's catching days for the Minnesota Twins were over to avoid future injury and seeing Mauer with a full beard on his 2016 Topps card (he's been clean-shaven on all of his cards up until now) you get the feeling his days as the hard hitting wonder-kin might be over for good as well. 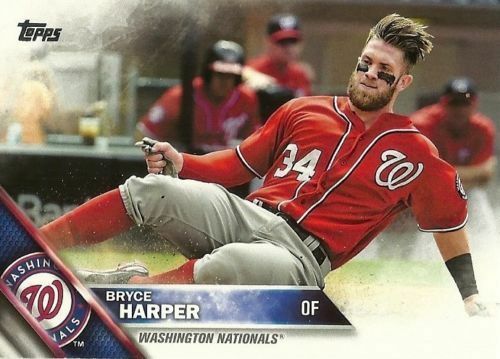 Topps made Bryce Harper their poster boy for the the 2016 Topps Series 1, putting him on the front of wax boxes and packs. 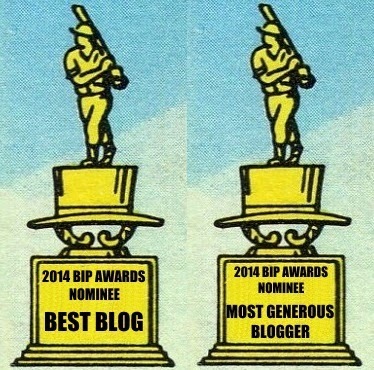 They also did him the honor of giving him a remarkable base card. The hair. The eye black. The perfect framing with his three teammates behind him looking on. Harper is also helped by the set design which looks like he's kicking up a lot of white dirt as he slides into home. 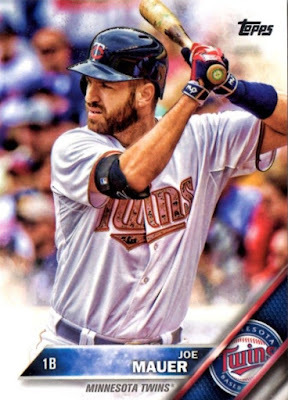 I think looking back a decade from now at Series 1, Harper's card #100 will be the crown jewel, especially if he keeps up his hitting pace which included becoming the youngest player to be unanimously voted MVP last season. 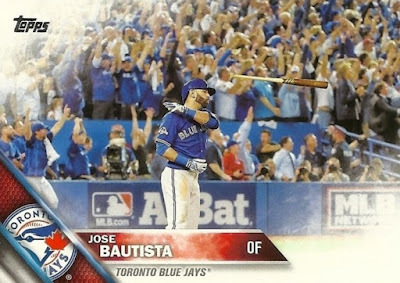 Jose Bautista's bat flip from the 2015 American League Divisional Series was the the flip that launched a thousand gifs on the internet. Topps would have been out of its mind to not include the most famous image from 2015 baseball in their next set and, of course, they delivered a horizontally-framed beauty. Unfortunately, the Jays ultimately lost the Divisional Championship Series and so this image lives on as a "what could have been" moment for Blue Jays fans. 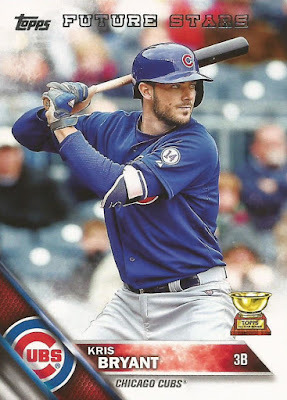 While Mike Trout gets the premiere #1 spot in 2016 Topps Series 1, Kris Bryant is placed as a bookend at the conclusion of the series as card #350. He's been awarded the Topps All-Star Rookie Cup as well as the moniker of a Future Star which will undoubtedly make this one of the most popular cards for the reigning National League Rookie of the Year. As baseball's most consistent pitcher (he hasn't finished in less than third place in Cy Young voting over the past five seasons), Clayton Kershaw's cards are always going to find a huge audience and this great looking Series 1 card with Kershaw in mid-wind upwill be no exception. If there was one thing that was made abundantly clear from the Kansas City Royals' playoff run, it is that Eric Hosmer loves to play the game of baseball. 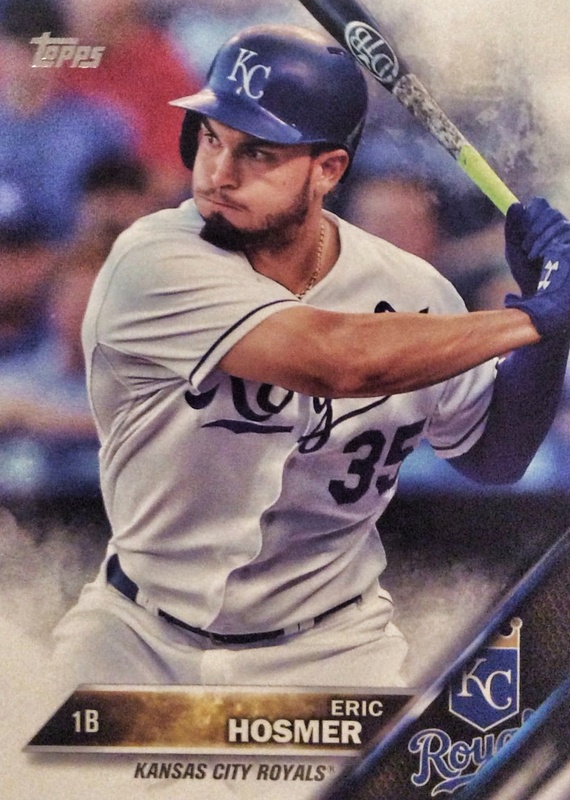 You would be hard pressed to find a more beloved fan favorite in all the league and his Series 1 card shows Hosmer about to deliver his standard 100% swing that he gives every time at the plate. Although at first you might only be interested in Alec Asher's 2016 Topps card because of the RC designation, but look a little closer and you may notice something on his right elbow. 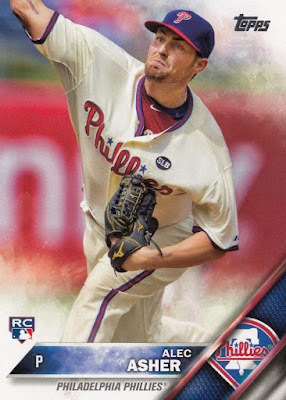 That is a scar from Tommy John surgery when he was 14 and definitely something you don't find a trading card everyday. As a collector myself, I've always been a sucker for a horizontally framed card. It gives the card a more cinematic feel on its longer side and Ryan LaMarre's RC from 2016 Topps is a great example of that. 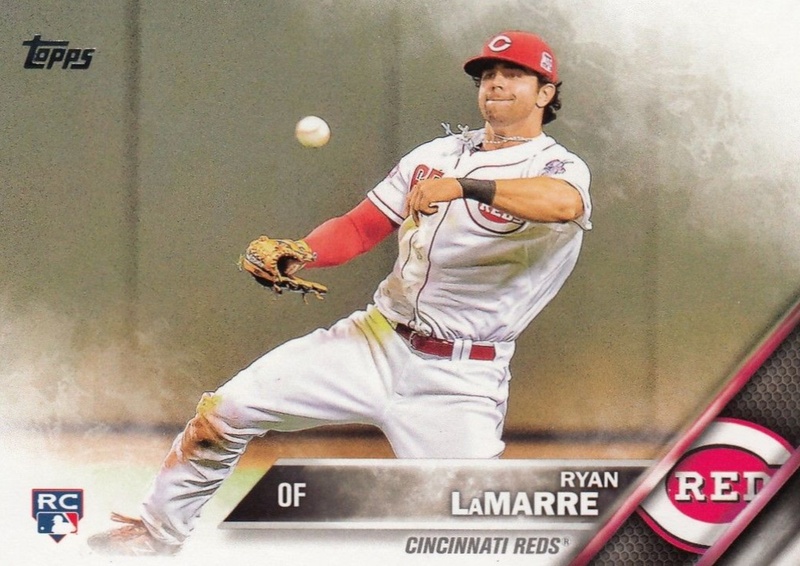 Each year there are also certain cards that benefit greatly from the new set design and I like how it seems LaMarre is throwing the ball out of the fog on the design. 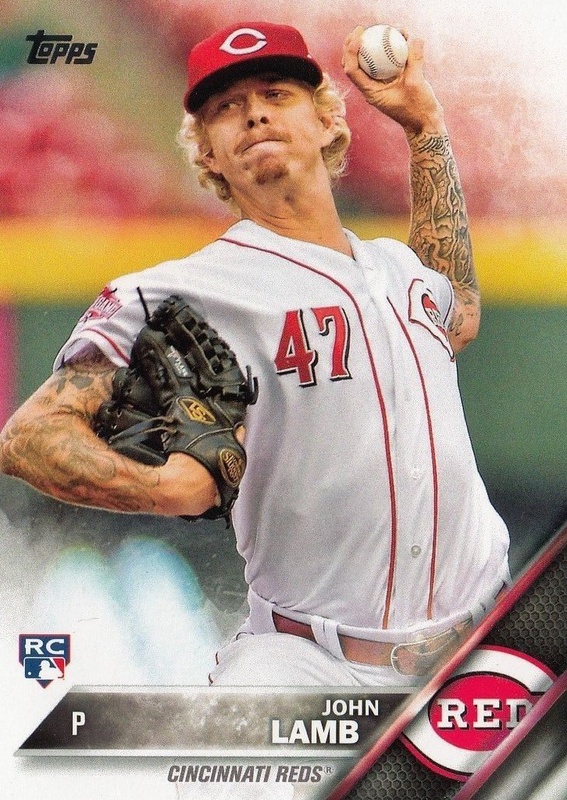 Giving Josh Hamilton's infamous arm tattoos a run for their money are Reds pitcher John Lamb's biceps which include near complete tattoo sleeves down each arm. Lamb, a long-time Kansas City Royals prospect, was traded to the Reds as a part of the Johnny Cueto trade last summer. 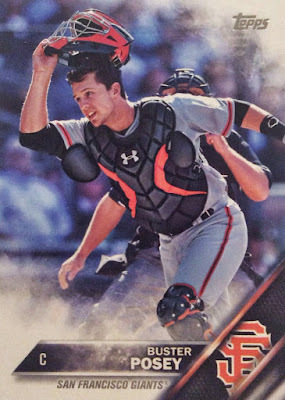 For collectors who wait with bated breath each winter for any news on the upcoming Topps release, Buster Posey's base card was probably their first look at the new design. As it was the first card released there was some speculation that it might be card #1 on the checklist, however Topps placed it at #300 on the checklist, a spot designated for elite players. 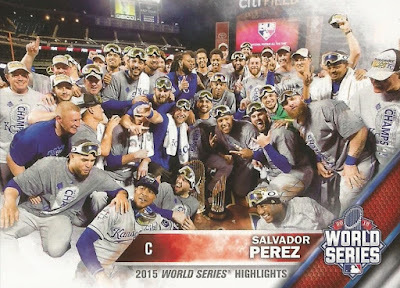 Even though the Royals surprised everyone in 2014 by making it to the World Series, there were few who thought they could possibly make a return trip, let alone become the champions. This card is attributed to Salvador Perez who was the series MVP after hitting .364 over the five games. The photo was taken from the Game 5 celebration but, unfortunately, it doesn't appear that Royals super-fan Paul Rudd was able to sneak himself into the group photo. The Houston Astros made a 16-game improvement from the previous year during the 2015 season and it was not doubt thanks to the play of Carlos Correa, Jose Altuve, and Carlos Gomez. 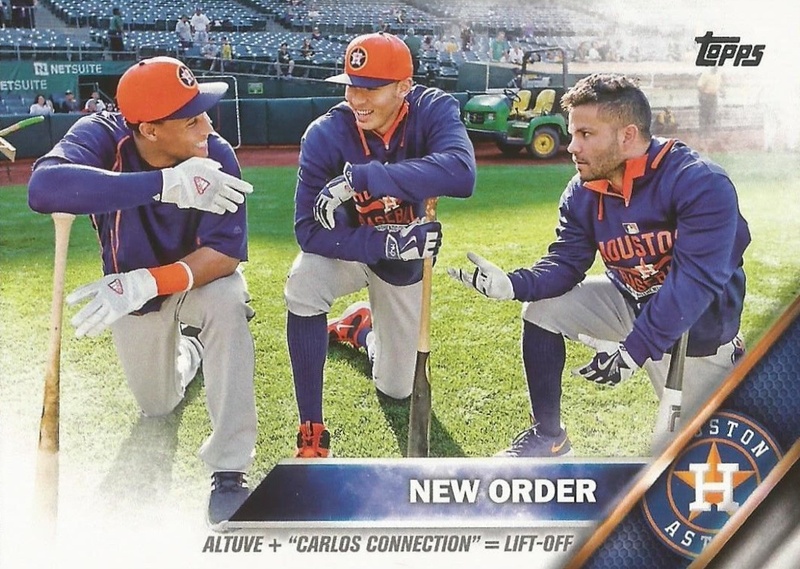 The sky is the limit for the Astros in the 2016 as the "New Order" may get them back to the playoffs yet again. And although I promised no inserts, I just can't finish this list without including the unquestioned best card: Latvia's greatest gift to America, Kristaps Porzingis!